The push furnaces are sorted to two-tube, four-tube, eight-tube, 14-tube, 15-tube furnace. The length of their high temperature metal tubes has 6 meters, 7.2 meters or 7.5 meters, the heating temperature from 500c to 1050c. 4 patents have been obtained on the square-tube furnace. The inner dimension of square tube is 300(wide)*70(high), the inner diameter of circular tube is Φ124. The refractory lining is made up of fibre blankets with good heat preservation. The furnace chamber by special patent designing makes temperature uniformity. 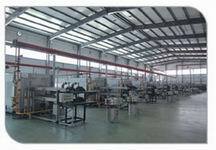 Company Name: Zhuzhou Diyuan Powder Metallurgy Furnace Co., Ltd.